Customer Thank You Cards – I Nearly Forgot to Share!!! Customer Thank You Cards – I Nearly Forgot to Share!!! I shared the Customer Gift I sent out to all my lovely October Customers about a week ago, but forgot to share the card! 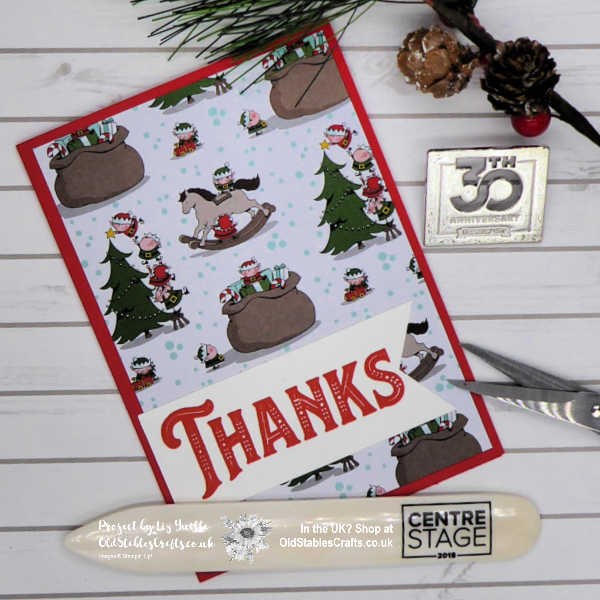 This is in the same style as the Gift, so uses the Santa’s Workshop Suite, one of the most popular suites in this year’s Autumn/Winter Catalogue. The Suite is the polar opposite of my usual style, but guess what, I LOVE IT! From the first moment I saw it, I knew it was going to be popular. This is such an easy card to make too, just cut some Designer Series Paper and a strip of Whisper White Card for the stamped image. Do the stamping, the Stamparatus is perfect for this when making lots of the same card, flag the end and you are pretty much done! How simple is that? Change the Sentiment for a Christmas message and you have a perfect, bright, easy Christmas card. You would be able to get 6 from each sheet of Designer Series Paper and 72 from a pack of Designer Series Paper. That is what I call value for money!! At the point of writing this post, the paper is still in stock, so why not get it while it still is?? Just hop over to my online store now. I used Warm Hearted, one of the Host Stamp Sets, for the Sentiment. This was very deliberate as all my customers who shopped with me in October, and used the Host Code, got the set as an additional Thank You from me. I love spoiling my customers, they are so important to me, why would I not treat them well? If they support me, then I like to look after them. If you don’t have the same stamp set, just use what you have! If you order from me during November AND use the Host Code, you could win a set of Many Marvellous Markers worth £112.75! For every £30 you spend in my online store AND use the Host Code, you will get an entry to the draw to win this great prize. For the draw only, you will get an entry for EVERY £30 you spend, even if that is over more than one order. This will NOT change how you earn Sunflower Rewards (details below). Today is the VERY last day to enter this, so if you want a chance to win this amazing prize, please don’t wait, order NOW. Join Today and You Can Order Spring/Summer Products at a DISCOUNT in December! The Starter Kit is ALWAYS the best deal in the Catalogue and great value at just £99 for your choice of £130 of products (with no additional P&P). If you join today, you will be able to order items from the new Spring/Summer Catalogue AND earn Sale-a-Bration items in December, at a discount! As a Member of this great Family, you get a minimum of 20% net discount on your future purchases. You also get income from sales you make to other people if you want to use this as a business. Win,Win Right? Just click on the picture to join the Team. If you decide that being part of the Stampin’ Up! Family is not for you, then just stop buying and you will revert to being a customer. Easy, simple, no quibbles! « Happy Anniversary to Me and Mine – Lots of Great Techniques to Share Too!